Our complete range includes Cast Polyurethane, Polyurethane Stick, Polyurethane Sheet, Polyurethane Resin, Moca, Industrial Paints, Abrasive Cut Off Wheels, Casters, Polyurethane Rods, Polyurethane Rollers, Fire Resistant Paints & Fire Proof Doors. Matcoat FD5 is an Alkyd Based Primers but designed in such manner that it dries very fast on application rendering the surface ready for overcoat. At atomospheric temperatures of above 30C, the overcoat can be applied wet on wet as it dries within 3 to 5 minutes. This is single pack air drying product which is suited for spray or dip application. Our organization is widely recognized for offering Jotun Futura AS Primers to our patrons. It can be availed at economical price. 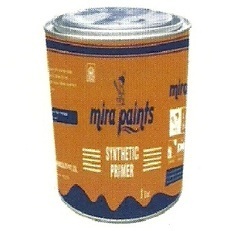 Product Description: Single component air drying type Zinc Phosphate based Alkyd primer. Goa Paints S Allifd Products (P) Ltd.